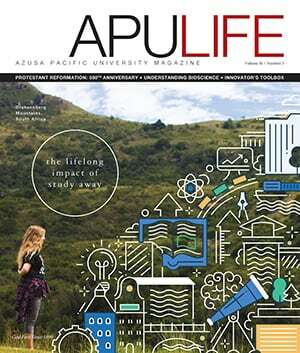 Azusa Pacific recently launched partnerships with 15 local school districts comprising more than 25 high schools, creating an additional pathway for students to attend APU. The agreement guarantees admission and provides renewable $10,000 scholarships, an application fee waiver, and support with the application process to graduates who meet academic requirements. Many of these students qualify for additional scholarships and grants, drastically reducing the cost of their education. The list of participating school districts continually grows, but currently includes Arcadia, Azusa, Bonita, Chaffey Joint High School District, Charter Oak, Chino Valley, Claremont, Covina-Valley, Duarte, Glendora, Monrovia, Rowland Heights, Temple City, Upland, and West Covina. For graduates of the Azusa Unified School District (AUSD), the $10,000 scholarship can be combined with the renewable $5,000 Nancy Moore/ Celebrate Azusa Citizen Scholarship for Azusa and Gladstone high school graduates and the Celebrate Azusa/ Cynthia Cervantes McGuire Scholarship for transfer students from AUSD who also attended Citrus College. The Azusa Scholars Program has graduated more than 50 APU students from Azusa since 2000. On average, APU enrolls 28 Azusa Scholars per year, amounting to $140,000 annually committed to the advancement of Azusa’s most qualified students. The agreement with AUSD began in fall 2017 and includes this year’s high school graduates who met the program’s academic requirements. Incoming high school freshmen who successfully follow the academic pathway all four years will be eligible. In addition, current sophomores and juniors who meet the requirements may pursue this option. Originally published in the Fall '17 issue of APU Life. Download the PDF or view all issues.